In our college, you’ll learn by doing. Research shows that certain teaching and learning practices are extremely beneficial to college students from all kinds of backgrounds. You get more engaged, you have a better experience, you learn more. Your grades are higher. And you’re more likely to graduate on time. All good things! Emma Cathell (Social Work and Spanish ‘16) conducted research as an undergraduate. She also studied abroad. She earned scholarships and found a faculty mentor. Now she has a Fulbright grant and will spend nine months teaching English to students in Mexico and serving as a cultural ambassador for the United States. Meet this Think and Do achiever. As a student in our college, you’ll find all these experiences that will have a high impact on your student career, and on your life. Introduction to Humanities and Social Sciences (HSS 120) offers an orientation to the culture, resources, research methods and interdisciplinary nature of our unique college. We want our newest students to jump in with both feet. And we want to introduce you to the intellectual breadth and depth of the college. HSS 120 is our unique Freshman Experience class. Each year, we focus on a theme that represents a major challenge for our society: in 2016, we’re investigating Beliefs and Ideologies; in 2015, we explored Wealth, Poverty, and Work; and in 2014, Violence in all its forms. You’ll hear from faculty experts from across Humanities and Social Sciences about work they’re conducting around our theme. In the process, you’ll improve skills that will help you succeed in college: critical thinking, writing, collaboration and information literacy. We support student-faculty teams and pairs so you can work on research projects together. Our college’s Undergraduate Research Awards provide funding to students as you learn the skills you need to become more of an independent researcher. You’ll also gain transferable skills and build long-lasting professional relationships with faculty members. For professor Jim Michnowicz and his students, what started as a class experiment is now producing intriguing research findings that will be published in a new book on language diversity. Their work, which provides further insight into the evolution of Spanish in North Carolina, also serves as a clear example of the kind of purposeful, community-based research that can be carried out by undergraduates. After transferring to NC State from Wake Technical Community College, Tarang Malaviya says he was inspired to "seek solutions to current problems." So, that's what he did. Volunteering to assist a doctoral student with environmental communication research, Malaviya helped study how mobile phone applications can help the public make sustainable choices. Undergrad Combines Majors, Presents Research across U.S.
Tori Williams has been busy this spring. Already consumed by her duties as a University Scholar, tutor and double-major in history and biological sciences, Williams added multiple presentations at conferences across the nation to her hectic schedule in April. 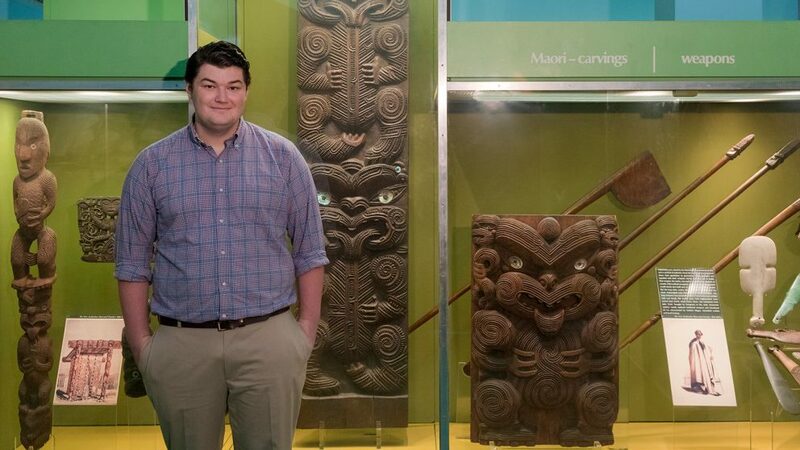 Working as an anthropology intern at the American Museum of Natural History, Colin Gravelle spent his summer researching vegetable caterpillars, tekotekos and other unique objects. Nothing beats hands-on experience to give you a taste of what work in a specific area is really like. Departments across the college provide internship opportunities for undergraduates. Find out if you’re suited for a particular field or career as you learn on the job. You’ll gain helpful experience, receive mentoring from your employer and get support and feedback from your faculty liaison. Internships typically culminate in a final project or paper and some form of reflective practice. We value and celebrate diversity. We welcome all backgrounds, including ethnicity, culture, race, gender, class, religion, nationality, sexual orientation, age, physical ability, learning styles and political perspectives. We’re committed to enhancing a climate within our college that attracts, recruits and retains a varied student and faculty base. We promote connections between groups, across cultures and within all the communities we serve. We champion diversity through scholarship, community and stewardship. We want all our students to see themselves here and to find a home where you can flourish and make a difference. We’re preparing the next generation of world-changers to not only Think and Do, but to face the challenges of a national and global workforce. In our college, you’ll have myriad opportunities to explore cultures, life experiences and worldviews different from your own. Citizens from around the world gather as students at NC State. You’ll be learning alongside students and taught by faculty from all corners of the world. Why not live in a global village as well? Our living and learning community -- Global Village – lets you explore cultures and worldviews different from your own, without ever traveling outside NC State’s campus. Global Village combines residence living with academic programming. Immerse yourself in another country and become a citizen of the world when you study abroad. You’ll earn academic credit, enhance your resumé, and have life-changing experiences. Study abroad is available to all NC State students. Our college is especially invested in supporting our majors in studying outside your home country. A new program, the Travel Scholars program, provides financial support for underrepresented populations interested in studying abroad. NC State's Office of Global Engagement recently caught up with Sinthia Shabnam, a double-major in sociology and political science. Learn more about Shabnam's experiences traveling abroad and her career aspirations after college. Our Students Think and Do. Nate Myers, a senior in Science, Technology and Society, is training students in photography, videography and music production at the Boys and Girls Club of Wake County afterschool program. You’ll have multiple opportunities to engage with the community and to make a difference. Whether through service-learning or community-based projects, on alternative Spring Break trips or through courses that take you outside the classroom – and perhaps outside your comfort level – you will stretch and grow. You’re guaranteed some eye-opening and life-changing experiences. And through it all, you’ll make important connections and hone skills that will last a lifetime.